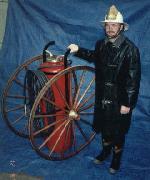 This 30 gallon wheeled soda acid extinguisher was probably the first fire apparatus in Depauville. It was located at the sawmill, and reportedly fought several fires in its day. We have restored it and it now appears occasionally in parades. This 1932 Sanford 3N Cub is unrestored and still runs, making occasional appearances in local parades. This photo of our Sanford was taken in 1999. As you can see, it is in remarkably good shape. Here are three generations of pumpers. At left is our 1993 Navistar/KME. In the middle is our 1961 Ward Lafrance Fireball (since sold). On the right is our Sanford. Please see the other photos for more information on each truck. Our newest acquisition - this 2014 1250/1000 Sutphen pumper replaced a 1993 International/KME pumper. 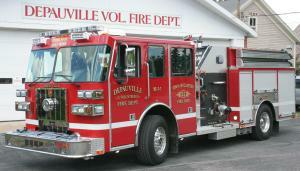 Tanker 16-5-1 carries 2000 gallons of water and is equipped with a PTO pump. It also carries a 1500 gallon drop tank. We named it "Soapy II" in honor of Glyndon "Soapy" Denesha, a longtime member of the department, after whom the original 16-5-1 was named. 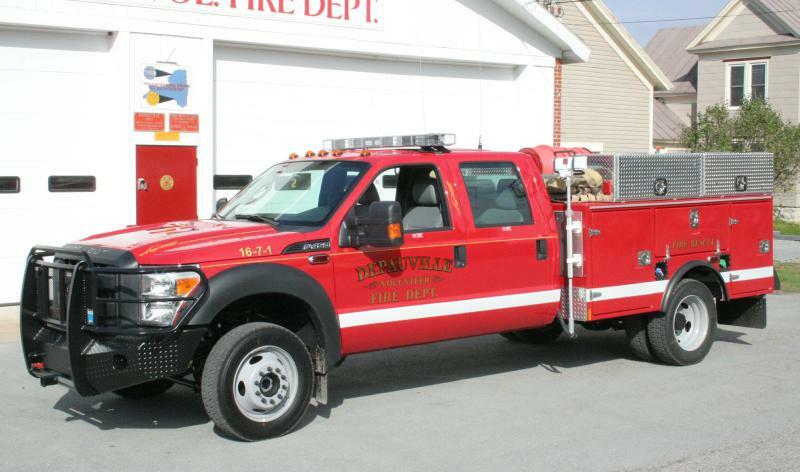 Our brush/squad is our primary response vehicle for grass/brush fires, motor vehicle incidents, and medical calls. It also serves as a tow vehicle for our trailer pump, our large backup generator, and occasionally for Clayton FD's airboats. With no hydrants in our district, we rely heavily on the old mill pond located roughly in the center of the hamlet. 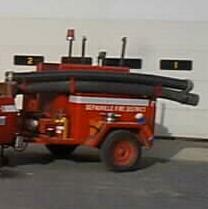 This trailer pump and its predecessors have existed to supply water for firefighting within and without the hamlet. For fires outside the hamlet, this rig sets up on one of two dry hydrants located at the pond to fill tankers. The 1000' of 5" hose on 16-1-1 eliminated our reliance on the 3" hose once carried by this setup, and mutual aid can quickly fill in the blanks. After the Ice Storm, FEMA decided to assist with the purchase of generators for needed facilities. Since our Banquet Hall serves as a shelter, it qualified. FEMA paid 75% of the cost of this 40KW generator set.